This is just lovely. Love the concept and the colours. This picture can be analyzed by reference to Psychoanalytic feminism. The way she's resting her hand on her son's head, made me realize that she is being very naturing. Psychoanalytic feminism is defined as individuals that over develop their abilities to empathize with people and under develop themselves as agents. In addition, which really reminds me of this picture, is that their great strength and weakness is their ability to be controlled by the needs of others. Way to go, Libby! I think your analysis is Very Good. While the theories are part of my consciousness, and because of my studies and teaching they tend to trickle into my work, I have to say that when I make these pictures, they are based on a feeling born from observation. Getting back to the ol' artist intention argument, it doesn't matter really how they came about. But sometimes I don't apply the theories at all because the images exist on the feeling level for me. So thank you for your clarity on this one. The details and the delicacy of expression are superb. Wonderful painting, thank you for showing. A very strong image; nice alternative to the blue and pink ones to come. wonderful piece...lovely colours and the comp is perfect! I just love this -- the concept, colors, and composition. The piece conveys a dreamy, imaginative mood. Beautiful. Wow this really is a fantastic piece. 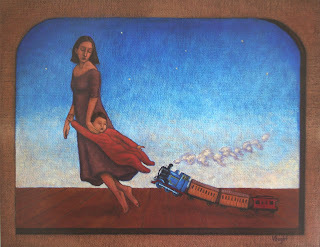 The colors are just wonderful, as is the little boy and train.